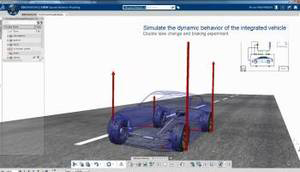 CATIA's Mechatronic Systems Engineer provides dynamic simulations of systems. Dassault Systèmes, a 3D design company with an extensive program for schools, has made 3DEXPERIENCE broadly available in the cloud for academic use. The platform includes several of Dassault's applications: CATIA for product design, DELMIA for digital manufacturing, SIMULIA for simulation and ENOVIA for collaboration. According to a Q&A on the company's site, the new edition is intended to support schools that "need more flexibility and ease of use," such as connecting to other institutions for collaboration or granting home use for students and instructors. The cloud approach also offers the promise, the company said, to eliminate "all hidden costs for running your own environment (servers, disk space, network, maintenance, IT resources to install and maintain, etc.)." Dassault noted that the cloud-based edition will expedite collaboration among schools on common projects. One institution can host the project and use its own licenses to invite external participants, who may or may not be using the cloud-based edition. According to the company, the cloud-based version of 3DEXPERIENCE will work on a DSL-caliber Internet connection. A link is required "mainly when opening or saving data, or when collaborating with peers," the company said. One customer, an instructor at École nationale d'aérotechnique in Canada, said he likes the speed of cloud-based deployment. "Getting the 3DEXPERIENCE for Academia on the cloud up and running took just under an hour," said Michel Michaud, whose school was one of the first to use the cloud offering through a preliminary testing program. Added David Gerber, a faculty member at the University Of Southern California School of Engineering, in a testimonial on the site, "We have started using the 3DEXPERIENCE for Academia on the cloud platform, and are really excited about the collaborative and integrated design possibilities it offers." As new updates surface in the software, customers will receive an email from Dassault a week in advance with details. The new software is available in English, German, French, Japanese and Chinese.